It’s time to start making plans for NEAF/NEAIC 2017! The events will again be held in at Suffern, New York, at Rockland Community College, just a short 30-minute drive from New York City. ATT Editor Gary Parkerson will be there to enjoy all of the festivities – plus tons of astro gear! He’ll be showing off the “Big Surry”, a custom-outfitted cargo bicycle, carrying all supplies required for self-sustained travel, including the latest in mobile communications, navigation and cycling-safety technology. Of course he also includes astronomical equipment for both solar and night-sky viewing and photography for public outreach. The NEAIC (Northeast Astro-imaging Conference) will kick things off with two days of seminars and displays of interest to those just getting started in astroimaging, as well as to the seasoned professional. Representatives of major imaging-products manufacturers will be on hand to show off the latest equipment and to share their expertise in person. Registered attendees receive entrance to all NEAIC daytime activities, continental breakfast and lunch both days and a two-day pass to NEAF 2017. There are also four optional evening workshops, which include: Workshop 1 (Thursday) Tom Field – Real Time Spectroscopy; Workshop 2 (Thursday) Robert Reeves – What’s Real and Unreal in Lunar Images; Workshop 3 (Friday) Dennis Conti – Exoplanet Observing Using Astro Images; and Workshop 4 (Friday) Ron Brecher – Deep Sky Processing with PixInsight. The event will be held on April 6 and 7, 2017 at the Crowne Plaza Conference Center in Suffern. The cost to participate is $275, which includes both days of the conference, and $60 for each evening workshop. For registration and other information about the event, visit www.rocklandastronomy.com. 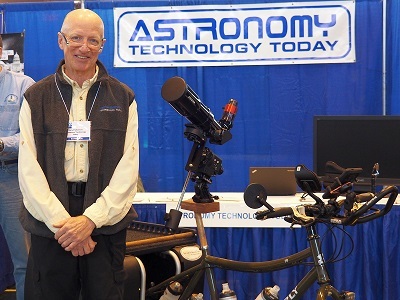 Over 120 vendors will be on hand to share their products, advice and personal assistance on April 8 – 9, 2017 as NEAF kicks off with row after row of astronomy equipment. The two-day event will also include the annual NEAF Solar Star Party, seminars, workshops, kid’s events, beginner sessions, door prizes, raffles and much, much more. The event offers a free Pro/Am Conference, which features free walk-in classes where you can learn how to do real science and collaborate with professional astronomers and scientists. Highlight presenters include Scott Bolton, Principal Investigator of the Juno Mission to Jupiter; Sara Seager, MIT, who will discuss the search for life on Exoplanets; Todd May, Director of NASA’s Marshall Space Flight Center; Barn Egan, ULA Commercial Crew Program Manager; Joe Rao, FiOS1 on-air meteorologist who will discuss the 2017 Total Solar Eclipse; and Mike Reynolds, FSC, who will talk about different ways to observe the 2017 Eclipse. Special rates for attendees and exhibitors are available at the Crowne Plaza, (NEAIC location and closest to NEAF), Suffern, NY, 845-357-4800; the Sheraton Crossroads, Mahwah, NJ, 201-529-0887; and the Courtyard Marriott, Mahwah, NJ, 201-529-5200. The ATT team hopes to see you there! For more NEAF information, please visit www.rocklandastronomy.com.